Group 13 contains the most essential adjustment and replacement procedures required for ordinary servicing of bodies. 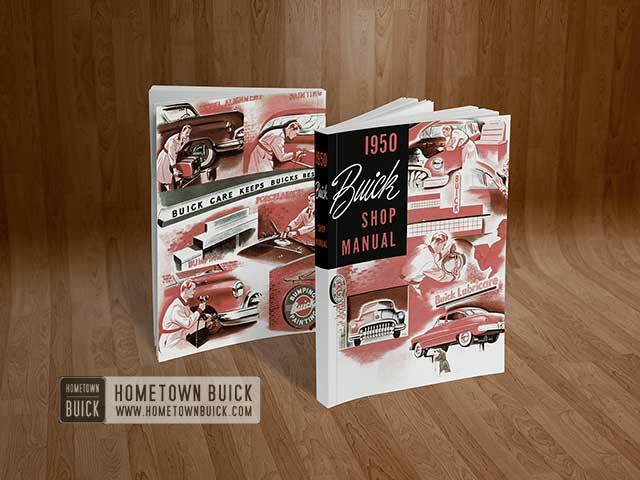 These procedures may be performed by any competent mechanic without specialized experience in 1950 Buick body repair work, and may be accomplished with tools and equipment usually available in a service shop. Refinishing, repairs to 1950 Buick body panels, and replacement of 1950 Buick body panels are not covered in this Group, since these operations require special tools and equipment as well as specialized training. Complete identification of each 1950 Buick body as required for service is provided by a plate riveted to the cowl on right side under the hood. See figure 13-1. 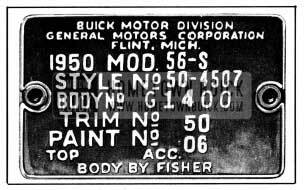 The Style Number and Body Number always should be furnished on every 1950 Buick body parts order, and on warranty claims and Product Reports relative to bodies. In addition, the Trim Number or the Paint Number should be furnished if the subject relates to trim or paint. The Style Number is a combination of the model year, car division number, and actual style number of 1950 Buick body. In figure 13-1, 50 represents the model year 1950, 45 indicates Buick Division; 07 indicates the body style. An X following the style number indicates that body is equipped with the Hydro-Lectric Power System. The 1950 Buick Body Number is the production serial number of the body. The prefix G denotes the plant in which body was built. When retouching of paint is required in service the paint should be the same number as specified for the paint combination number on the 1950 Buick body number plate (fig. 13-1). Unless the new paint contains the same pigments in the same proportion as the original paint, the new paint may weather out off-color even though it appears to blend with the original paint at time of application. Sand entire 1950 Buick body to smooth out rough spots and insure proper adhesion of new finish. When refinished areas are thoroughly dried, sparingly wax entire 1950 Buick body. Deterioration of chrome plated parts can be avoided by keeping the parts clean. The accumulation of traffic film, mud, etc., should be removed at reasonable intervals by washing with plain water and wiping thoroughly dry. Seepage of destructive elements through the pores of the chrome plating can be retarded by application of a body polishing wax or a light mineral oil. The material should be applied with a soft cloth and then all surplus should be wiped off. For the removal of spots caused by ordinary soilage, we definitely recommend the “volatile type cleaner,” preferably a mixture of carbon­tetrachloride and cleaner’s naphtha. Do not use any gasoline which is colored or which contains tetra-ethyllead. Do not use volatile fire extinguisher fluid. Immerse the small cloth swatch in cleaning so1ution, wring out and allow medium evaporation. To clean top, brush with whisk broom to remove dust. Most dirt spots can be readily rubbed off with a piece of crude rubber or art gum. If necessary, the top may then be thoroughly cleaned with mild soap and lukewarm water. If, after drying thoroughly, any spots still remain, they may be removed with ordinary gasoline (not Ethyl), naphtha, carbon-tetrachloride or Carbona. These cleaning agents should be applied very lightly. Do not soak the material. Many different compounds are used as cements and sealers in the construction of a 1950 Buick body, and many different brands are available for service use. It would not be practical to stock all of the compounds used, or to discuss here all of the brands available. This semi-heavy black compound is a flexible rubber sealer for general use in sealing welded seams inside the 1950 Buick body. It is also used for sealing 1950 Buick body moldings. It is non-drying and its ability to stay in place without flowing makes this sealer useful for many purposes. This sealer is a sprayable black coating for use on metal surfaces underneath the 1950 Buick body. It is especially useful for sealing all welded seams and crevices against entrance of dust and water. It also acts as an insulator against noise and extremes of temperature. At each closed 1950 Buick body mounting point a rubber shim is placed between the 1950 Buick body and frame, a rubber insulator washer is placed under the frame side rail flange or hanger, and flat steel washers and a tubular spacer limit compression of the rubber parts to a predetermined amount as the body bolt is tightened. See figure 13-2. This form of mounting eliminates metal-to-metal transmission of road and chassis noise into the 1950 Buick body. Note in figure 13-2 that the No.4 inner bolts and mountings were used in first jobs only. If these parts are removed for any reason they may be discarded as mountings are not needed at this point. When these parts are discarded, work 3-M Caulking Compound or other suitable material in around the anchor nuts in body floor pan to prevent them from rattling. At each convertible coupe mounting point a solid composition shim is placed between the 1950 Buick body and the frame, and a flat washer and bolt anchors the 1950 Buick body to the frame. See figure 13-2. 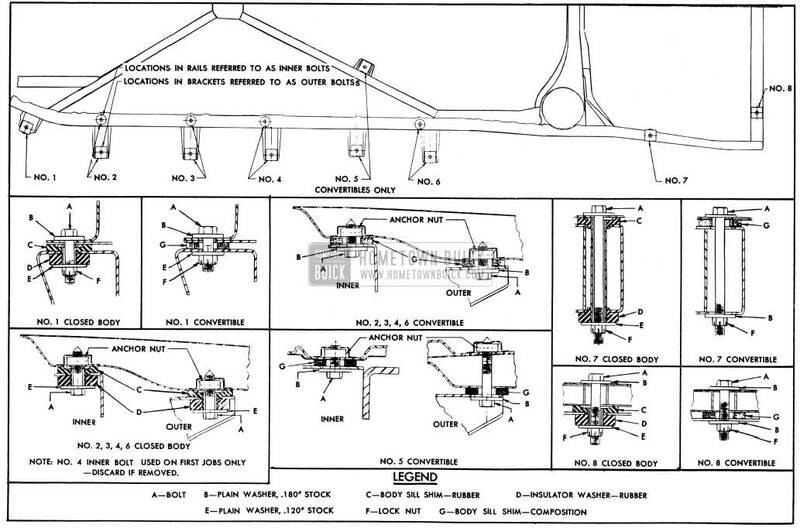 In addition to the parts shown in figure 13-2, steel shims are added as required at individual mountings to compensate for variations in body and frame in order to insure a firm mounting without distortion of body. Whenever it becomes necessary to remove body mountings, care must be taken to reinstall all of the mounting parts and steel shims in their exact original positions. Convertible bodies may be re-shimmed in cases where door locks do not latch securely after door is properly adjusted in body opening (par. 13-7) . In such cases, shims placed under the ends of body will close in the body door opening sufficiently to insure proper latching of door locks. When body bolts are tightened use a torque wrench to tighten all bolts uniformly to 25-30 ft. lbs. torque. The specified torque is very necessary to insure proper compression of convertible body mounting shims, and to insure tightening against the spacers in closed body mountings. Excessive tightening must be avoided as distortion of mountings will result.